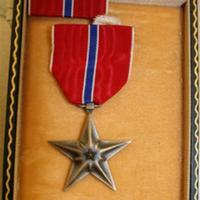 Bronze star with 2 pins. Red, blue and white ribbon that star hangs from. Back of start has text "Heroic or Meritorious Achievement"